Dan Kilgore was the pastor at Trinity UMC when I made the journey mid-stream of my college career to Tuscaloosa, Alabama and the University of Alabama. I was still trying to determine my denominational identity, but having seen the United Methodist Church on the very fringe of campus (it was merely a half block away from the all-girls dorm, so in my self-guided tour of Campus and various points of interest, it was not a big stretch to come across this uniquely situated church). I had spent my K-12 years attending the United Methodist Church and wandered from the UMC during my first couple years to explore other denominations, and hadn’t yet settled. I started the next Sunday, and was invited to a couple of dinners, one mid-week and one following church on a Sunday. Being the “starving college student”, who was I to turn down a free meal? Brother Dan was also associated with the United Methodist Campus Ministry, the Wesley Foundation, which was headed at the time by Ken Smith. I was desperately in search of opportunities to play Intramural Sports, and I knew campus organizations were often a fabulous starting place to find activities and other friends. I had just left one 4-year university after 2 years to attend a school I had never seen before I drove in overnight from Atlanta, and my old digs, to take up residence in Alabama, which I had aso not entered before that new journey. I needed to have a sense of belonging, and Trinity UMC, and the Wesley Foundation helped me define my identity because they settled me into my belonging. Dan was there as I began to understand myself better, and heard the call to ordained ministry. I started my process in the North Alabama Conference, became a certified candidate, affirmed by the SPRC and Charge Conference of Trinity UMC. We would meet almost every week to discern ministry, my place, and God’s movement. I remember sitting down in his office, watching him roll up pieces of bulletins or stray junk mail, as we talked through my girl issues, plans at Wesley, concerns he had about the running and leadership of Trinity, the joys of success in all the above areas of life and many more. When my parents came to visit at the end of my time at the University of Alabama Dan and Glenda, his wife, invited us over, and were kind enough to share the Trinity Parsonage with my folks for a few days as we all conversed, traveled and ate, considering the next phase of life for me, the seminary life, at Candler School of Theology in Atlanta. The Kilgores were kind hosts, and I know my mom especially appreciated the chance to spend time with Dan and Glenda. Attending Seminary at Candler, I was still associated with the North Alabama Conference. Trinity continued to support me, and Dan would talk with me regularly about what was happening. One break I came back to Tuscaloosa to visit with friends, and stopped in to see Dan. We discovered that during his time at Candler in the 1960s he had several professors I was then encountering in my studies in the late 1990s. In fact, during the first 2 semesters I had 5 professors that Dan had during his time. The small world we had shared in his office those earlier years in discernment of my ministry was now connected more deeply. 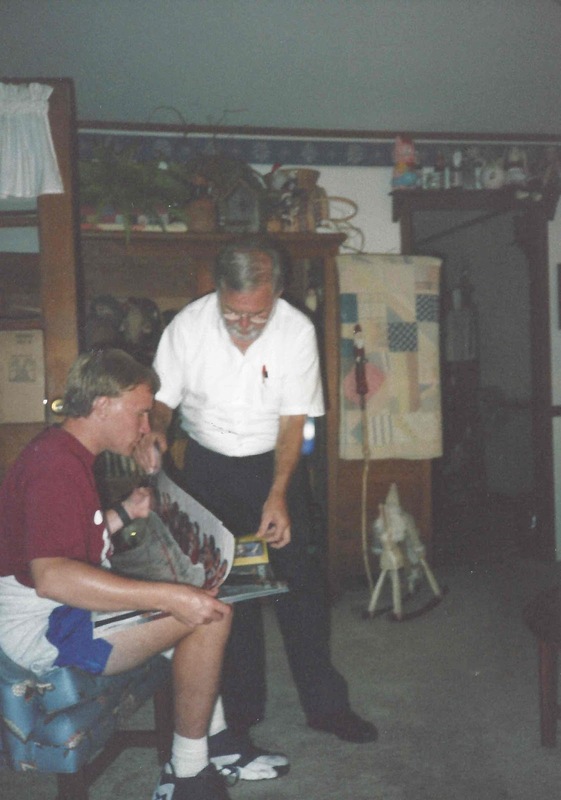 Following my graduation from Candler in 1999 I left to return to my home state of California, and began ministry there. 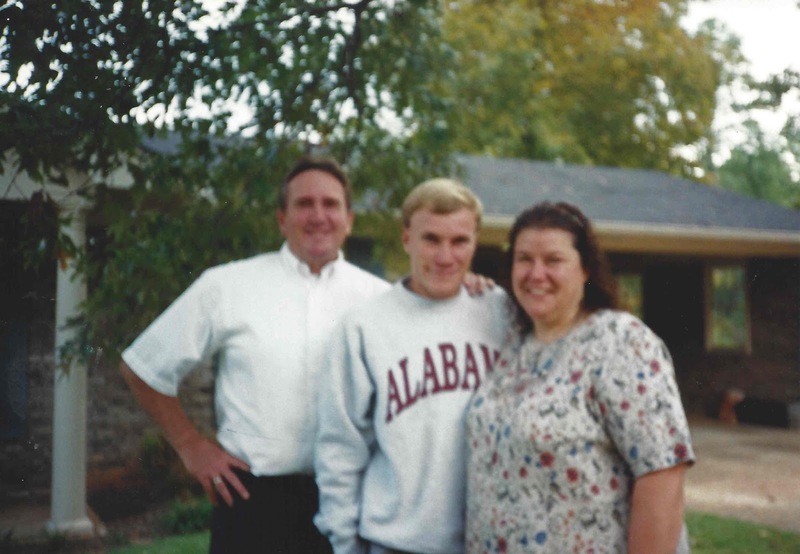 I still touched base with Dan and Glenda over the years, as I tried to make sense of the first few years of ministry. I sent Christmas cards, and invited them to my wedding to Anna Crews in 2004. Dan was a touchstone for my ministry, especially at those moments when I needed to be reassured of my call and the hope of the work we undertook in this profession. I returned to Alabama in 2017 to undertake ministry with Anna here on the other side of the state, in Auburn, a big-time rival of my alma mater. I was without work for the first 6 months, and began to search for touchstones to help me stay grounded and I reached out once again to Brother Dan. In July, I took an appointment at a church in Auburn, and I called on Dan as I sought a mentor. He was familiar with ministry in this new to me context, as the pastor of the smaller church in a college town, trying to navigate in an unfamiliar location. I was just beginning to find a rhythm of what our mentor-mentee relationship might be and look like when I got word today that Dan passed away. I am forever grateful to Dan for his kindness, and his presence with me, as I made these various big life transitions. He reminded me time and again to slow down with it, whatever “it” was, because God was already present and working on “it”. 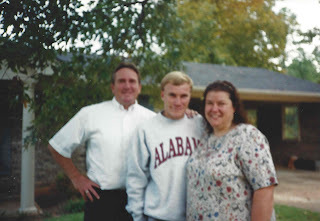 The pictures I found show my folks and I in Dan and Glenda’s front yard in Tuscaloosa when they stayed with him, and in the Kilgore’s basement of that same house where we were talking about some topic of the day. Dan obviously with head bowed was once again patiently explaining some aspect of whatever we were looking at. As always, it is a pleasure to spend time with Dan, and Glenda. I will remember you well, Bro. Dan.